The nose is a defining facial feature, so many individuals who are unhappy with some aspect of their nose turn to rhinoplasty (nose surgery) for improvement. As a whole, most patients achieve wonderful results. However, the fact remains that rhinoplasty is a complex procedure that requires master knowledge of the anatomical structure of the nose as well as meticulous precision and skill. It is imperative to select a highly qualified, board-certified, and reputable surgeon to achieve the best outcome. The final result of nose surgery can sometimes be unsatisfactory, appear too obvious, or lead to other uncomfortable health problems. The good news is that patients can opt for revision rhinoplasty to address their concerns after their first nose job went wrong. The most common issue many patients have after a nose job gone wrong is in the outer appearance. Patients with external concerns are advised to wait a year for their nose to completely heal and take shape before considering additional treatment. Swelling is known to subside naturally after some time. However, there are more severe concerns that require surgery to correct. A scooped out bridge can occur when a cosmetic surgeon uses an osteotome or chisel when operating. Using a chisel leaves little room for error because it takes out the bridge of the nose in one movement. Revision rhinoplasty can correct this problem by rebuilding the bridge using cartilage from other areas of the body. When the area above the tip of the nose appears overly full, it subsequently causes the nose to protrude downward. If the surgeon does not recognize the tip-supratip relationship or incorrectly predicts how the nose will eventually heal, it may lead to this type of complication. It can also occur if the surgeon did not reduce the cartilage enough or was too aggressive on a nose with thicker skin. Rhinoplasty revision can restore the aesthetic appeal between the bridge and tip of the nose by resecting the excess cartilage and supporting the nasal tip. The tip of the nose can be susceptible to several problems, primarily the loss of too much cartilage, which can distort or even collapse the nostrils. 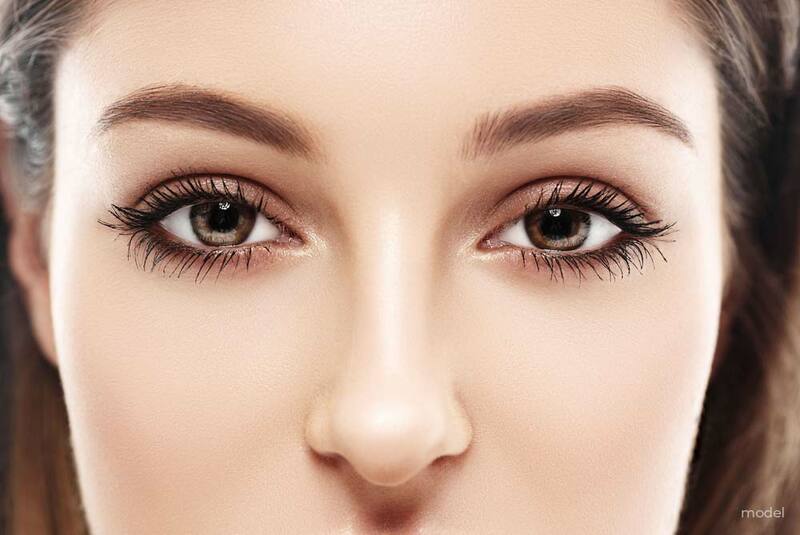 Overextension on the tip of the nose can also make the tip appear too prominent. A revision procedure may involve replacing the lost cartilage to restore the nose to a more natural appearance. A twist in the nose can occur in the nasal bones on the top and tip of the nose. Straightening a crooked nose may be difficult to achieve during rhinoplasty, but strengthening the cartilage with sutures may produce the desired result. Rhinoplasty can also, unfortunately, affect the inner areas of the nose. Although these types of complications are less common than external imperfections, they can present problems that may be permanently damaging. Most nasal congestion that occurs after rhinoplasty is due to postoperative swelling or crusting that dissipates within a few weeks or months. Long-term nasal congestion is concerning but can be evaluated and treated accordingly. Potential problems such as turbinate hypertrophy, deviated septum, scarring, or major alterations can also contribute to breathing problems. Damage to the nerves and numbness are problems that are commonly resolved weeks to months after surgery. Motor nerves in the nose move the muscles, and sensory nerves correlate to the sense of touch. During rhinoplasty, the sensory nerves on the nose and occasionally on the upper lip are temporarily severed. In some cases, long-lasting or permanent numbness may occur. Infection after rhinoplasty is an uncommon occurrence and can be treated with antibiotics. In exceptionally rare cases, it may require special care and attention from both the surgeon and an infectious disease specialist. If you have any questions about rhinoplasty or revision rhinoplasty, please fill out our online contact form for more information. Revision rhinoplasty is designed to correct issues (both aesthetic and functional) from a previous nose job. Dr. Gabriel Chiu typically performs rhinoplasty using either a closed or open technique. The open approach involves creating an incision across the nose base, while the closed approach requires internal incisions. The method that is used depends on the goals of the surgery as well as the surgeon’s recommendation. Surgical details are tailored to fit each unique case, but, generally, bone and cartilage are reshaped or removed. Cartilage may also need to be taken from areas like the ears or the septum to restructure the nose. Communicating any issues or concerns about your rhinoplasty with your surgeon is important. Certain minor or temporary conditions may not necessitate a secondary procedure, but revision surgery is appropriate for correcting aesthetic imperfections or breathing problems. How Soon Can I Undergo Rhinoplasty Revision? There’s no doubt that a bad nose job can be a disappointing and emotional experience. Naturally, many of those affected are driven to correct the issue immediately. However, revision rhinoplasty is usually performed at least one year after the initial surgery. It takes a decent amount of time for the body to heal and for the swelling to subside. Swelling may not seem significant, but it has the power to distort the actual results of rhinoplasty surgery. It can make the nose appear larger than it truly is, as well as convince the patient that his or her facial appearance is less attractive. Moreover, waiting for a year will allow scar tissue to soften and make the revision procedure easier to perform. It is impossible to control how a rhinoplasty procedure will go once it begins, but there are many ways to avoid a displeasing nose job. Carefully choosing a qualified surgeon is the first and most important step. During your initial consultation, communicate the specific reasons you would like rhinoplasty and be assured they are realistic. Look for a proper diagnostic evaluation and ask to see before and after photos to get a sense of the surgeon’s technical and aesthetic skills. Selecting an expertly trained and experienced plastic surgeon to perform your rhinoplasty surgery can erase the concerns you may have. Dr. Chiu applies his expertise and artistic precision to create exceptionally natural-looking results that are customized to the individual. For further information about primary as well as rhinoplasty revision surgery call (310) 586-3449 and schedule your consultation appointment.